2. This depends on the percentage of grape juice. If there is a majority of grape juice (51%), recite hagafen/al hagefen. However, if the mixture is rov water (or another beverage such as apple juice) the brochah depends on various factors. See Rama 202:1, M.B. & Biur Halachah. Consult a Rav. 3. Nikker means it is still noticable. Typically, shredded coconut or grated potatoes are still “nikker” and the original brochah is retained. However, if finely ground or processed, the original form is no longer “nikker” and the brochah is changed to shehakol. See M.B. 208:37-38. 4. 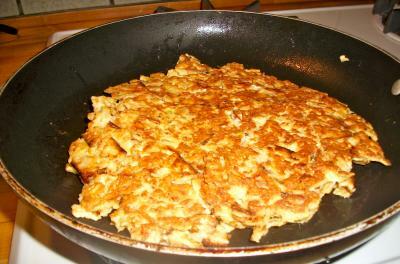 Matzah brei is typically made from matzah that was broken into pieces less than a kzayis. (The fact that they are reformed into a kzayis is irrelevant). The halachah is as follows: If the pieces of matzah were boiled in water (or submerged into a kli rishon) or the matzah is no longer nikker (e.g. fried in oil with eggs), one recites mezonos/al hamichya. If however, the matzah meal was not boiled and the matzah meal was only pan fried with no oil or butter and the matzah is still nikker, one recites hamotzi/birchas hamazon. See Shulchan Aruch Orach Chaim [S.A. O.C.] 168:10 & M.B. 5. Egg matzah and matzah ashirah may not be eaten on Pesach according to Ashkenazic practice, except by the sick or elderly who cannot eat regular matzah and require egg matzah. Consult your rav. Please note: Even the sick and elderly cannot fulfill the obligation to eat Matzah at the Seder with these types of Matzos. As noted in the chart, in general, the brochah rishonah is mezonos and the brochah acharonah is al hamichya. However, if one is kovaya seudah on it (e.g. as part of a full meal) recite hamotzi and Birchas Hamazon. See Rama O.C. 562:4. 6. The brochah acharonah on wine and grape juice made in Israel ends with the words “v’al pree gafna” (instead of “v’al pree hagafen”). See Birkei Yosef O.C. 208:58. 7. We assume the pieces of matzah are still nikker as matzah or at least one piece of matzah remained a kzayis. See S.A. O.C. 168:10 & M.B. 8. We assume that the matzah rolls are made from matzah meal that was put into a kli rishon of water or the “rolls” do not have the texture of bread (i.e., no tzuras hapas). See S.A. O.C. 168:10 & M.B. STAR-K wishes you a chag kasher v’someach!